Children are an important part of any fire safety plan and teaching them about the importance of being cautious and careful around fire is a big step in preventing fire related accidents. Every year children playing with fire set more than 20,000 fires. Let’s take a look at what you can do to help prevent, prepare and practice for a fire to lower the chance of it happening to you. Smoke Alarms- test smoke alarms once a month, replace the batteries every year and replace the entire smoke alarm every ten years. These should be located inside AND outside every sleeping area, on EVERY level. A monitored Smoke/CO detector gives you an extra level of protection. You can focus on getting out safely, while the fire department is dispatched for you, even when you are not home. Upper levels of the home should have escape ladders stored in a place that is easy and quick to get to in an emergency. Keep anything that can burn at least three feet away from heating equipment – furnace, space heater, fireplace, etc. Never leave the kitchen unattended while cooking. Create three feet, “kid-free zone” in the kitchen around the stove and areas with hot food or drink. Inform babysitters or nannies of the escape plan for when you are not at home. House numbers should be clearly marked and easy for the fire department to find. When fire is present, close the doors behind you as you leave, this can slow the spread of smoke, heat and fire. If there is smoke, get low and go under the smoke when escaping. Once outside, stay outside. Do NOT go back into a burning building. Create a plan that is easy to remember for any family member in case of a fire. Developing a plan before an emergency will help your family respond quickly and calmly if anything were to happen. Draw a map of your home. Mark two exits from each room and a path to the outside from each exit. Teach children how to escape on their own in case you are unable to help them. Agree on a meeting place outside of the home that is a safe distance from the house – a mailbox, street sign, neighbors, etc. Practice your home fire drills twice a year. Looking for a fun way to get your children involved? 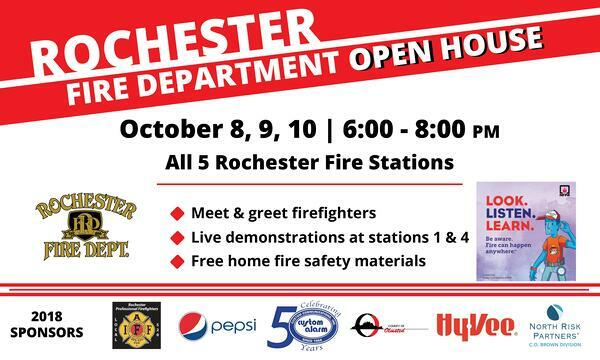 Fire Prevention Week is celebrated October 7-13 and the Rochester Fire Department will be hosting an open house at all five fire stations, Oct. 8-10 from 6:00 – 8:00 pm each night. Custom Alarm will be at Fire stations 1 & 4 with some fun giveaways and educational material to help your family prepare!